9mm Ammo - 1000 Rounds of Bulk Fiocchi 115gr 9mm FMJ ammunition from AmmoMan - Free shipping on bulk ammo! 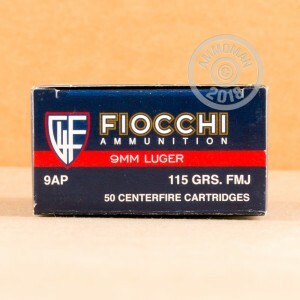 This 9mm Luger ammunition from Italian manufacturer Fiocchi is one of the best range/target loads available thanks to its combination of reasonable price and good performance. 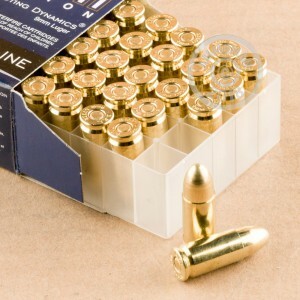 Available here in a 1,000 round case (20 boxes with 50 rounds in each box) for high volume practice, this load uses a 115 grain full metal jacket bullet. Fiocchi ammo uses non-corrosive Boxer primers and brass cases. To help keep shipping costs down, Fiocchi produces most of its ammo for the US market in Ozark, Missouri. As a standard pressure load, this ammo is great for range practice in popular CCW pistols such as the M&P Shield, Sig P938, and Springfield XDs. Like all orders over $99 placed with AmmoMan.com, it will ship direct to your door for free! Great ammo at a great price ... with lightning fast shipping! My third order with Ammoman and I will continue to order from them! The box was a little beat up, I’m glad I paid The small fee for discrete packaging, I’m sure the rounds were safe during transit. Very conscientious company, they called prior to shipping to verify my address was correct. I would highly recommend. The outside box and individual boxs appeared to have seen water in there travels. Packaging could have been better. The ammo is functioning fine, a little more flash than S&B but just as accurate. Consistently good performance with no failures to fire or feed in my 1911. Gun is practically clean after a match! Sale price makes this ammo as cheap as other much dirtier brass-cased ammo. I have gone through at least 4,000 rounds of this ammo. One of the cleanest I have used. ZERO problems with this ammo. When the ammo arrived (which was fast) my son and I put 200 rounds each with no problems. I'm ready to order more. Had no problems with cleaning the weapons. I have several thousand rounds of 9mm Fiocci through my CZ 75 and Glock 19. I cannot recall a single misfire or jam. This is excellent target ammo. Great ammo and good prices. Used this in my rugers and glocks with no problems. Shoots clean too. Fast delivery. Ordered a thousand for practice almost done with this junk. Would not trust in my glock ever. Multiple feed issues along with stove piping. There were a few that didn't even detonate even though there were solid primer strikes. No more for me ever! For your ammo needs, I recommend Ammoman. Was pretty good ammo but the target keep moving. Great ammo at a great price. Shipping was lightning fast. Will be ordering from Ammoman and have already shared my experience with my friends. I would recommend this ammo to anyone looking for quality range ammo. Very happy with the ease of purchase and the very quick delivery ! Can't go wrong with this ammunition and extremely accurate and clean. Make America Great Again! Nice product please feel free to put 9mm Fiocchi on sale anytime! Clean firing hardly had any residue! The previous ammo I used really left my Glock 43 dirty. Excellent ammo supplier,affordable price. extremely helpful customer service.Speedy delivery. Great value. I didn't get a chance yet to use the ammo yet but I used fiocchi before. I am happy with the purchase. Great price & service, quick delivery. Thanks ammoman..I am happy a friend recommended you.I started to spread the word. I have always liked Fiocchi ammo. Great service. Delivered fast. Good price. I will definitely order from Ammoman again! Awesome site cannot go wrong! I have sent 200 of the 1000 rounds I purchased down range without issues. No FTF or FTE. Also very clean. This a great ammo. Shipment was lightning fast. Will buy more later. This ammo burns clean and is very accurate. This is my "go to" for range ammo. This is a first rate ammo. I have fired 400 of the 1,000 rounds I purchased. Have not had a single issue in two different Springfields. This is a great range ammo. Very accurate and clean. I'll order more. Ammoman.com is my go-to ammunition source! Fast shipping, reliable, great customer service! This is the cleanest ammo I have used. My Glock 17 seems to like it. Amazing price very fast shipping ammoman awesome. I just purchased this amazing ammo and never been happier out in the shooting range. Very fast shipping and handling was free man you can't beat the price, Ammoman you are my favorite ammo finder that I search. I will definitely keep purchasing from AMMOMAN always. Good stuff for the price !! Good fast service. ...good ammo. ~20,000 rounds through Glock 19, but first time with the 4,000 rounds of Fiocchi ammo just purchased. Disappointment is with the amount of flame. There's a flame blast that's about a foot long and about as much in diameter follows. With only 200 rounds shot so far I don't have an opinion whether this will contribute to fouling / dirt. Have slow-mo video alternating two different ammo but don't see how to upload a link. 3,800 rounds to go, I'll get used to it I suppose. Have gone through more than 1,000 rounds without ANY problems. Find this to be cleaner than most ammo I have used. No. 1 on my list. I highly recommend Fiocchi ammo. My experience with it has consistently positive - I would put this on a par with any other producer and better than many. Have shot over 700 rounds without a dud. No problems what so ever. Very satisfied with whole experience. Have shot about 200 rounds so far and have had no issues. Impressed at how clean the ammo is. I always clean my guns every time I shoot and was amazed to run a patch without solvent and it was completely clean. So far I am impressed with Fiocchi. If this continues I will be purchasing more of this ammo. Got my ammo on time and quickly. Very happy with this ammo! Great ammo! Super clean. Shot 400 rounds at the range with no jams, plus not a single jam or bad round in the whole 1,000! I was shooting Winchester white box before this purchase, my Beretta PX4 is way cleaner after a day at the range. I an very happy with the products and service through Ammoman. I would definitely recommend this ammo. Shoots great and the the price isn't bad either. Great product. Very clean ammo. This is a good product. Good service. Will order again. No misfires and no jams...........good quality! Part of my reserve stash. Great service; thanks! What more can I say...competitive prices, wide selection of products, smooth ordering process, and quality shipping and delivery. Definitely will order from Ammoman again! Fiocchi says 115 FMJ have 1260 ft/sec, as fast as some +P. quality ammo,good price, I recommend it. Great performance and price. Wonderful customer service. My wife shot 250 rounds thru her s&w m&p ported barrel and never had a misfire. Shells are awesome. 1st time shopper! Very satisfied with selection, price, ease of ordering, checkout, and delivery. Will use again! I've bought many different cases of ammo from Ammoman, have NEVER had a problem. 9mm Fiocchi groups small, runs well and clean, plus at a very low price!! Fiocchi is solid, ammoman has great prices. Good stuff all around. Best price around.Fast shipping.This is my favorite pistol ammo.More accurate than most brands and a little less recoil. This ammo was clean burning. i have run 300 rounds thru my FNS 9 with no problems. Good target ammo. My FNS 9 shot well with it. Have ran about 300 rounds thru it witn no problems. Lots of website have great prices on ammo, but the shipping kills you. Ammoman free shipping makes them the best total.price. Fiocci (9mm rounds) was recommended by certified NRA range instructor - lowest price with least ammo problems. No complaints with the first box of 1000 rounds. Super fast shipping, excellent product. Great deal and fantastic customer service. I have never had a problem with Fiocchi ammo. Shot 20 rounds in a brand new Sig P290RS. Failed to fire 2nd and 9th rounds on first strike. Not sure if its the gun or ammo. Either way, good enough for range practice. Ordered this up the day after I ordered a new FNS-9C and upon delivery I promptly fired off 200 rounds without a single malfunction. I've since fired off a hundred more without a single hiccup. Best price I found and great results so far! Hope to be back for more! Ok but dirty. No rtf or ejection issues. Great price. Great service. Clean your weapon after 100 rounds. Dirty powder. Great shooting ammo. Fabulous pricing! Eric and the guys at Ammoman never disappoint! Great ammo st rock bottom prices. Eady order process, and fast reliable delivery! Eric and the guys at Ammoman are always there for me. Prompt processing of my orders and deluvery within a few days. Been buying their ammo for years; never a problem! Shot this ammo in a Beretta 92FS and Ruger SR9c without a single problem. Price was good and shipping was very quick. Will buy again. I bought seversl cases of this fiocchi 9mm because of the great deal offered. I fired 15o rounds this morning in my sig X6. And they ran flawless and clean. At these delivered prices can't do better anywhere!!!!! This ammo has proven to be a good value per your shooting dollar. Clean, prints pretty good groups. I normally use pmc bronze for my range ammo but gave this a shot. I had no problems with the 3 boxes I shot but I won't be replacing my trusty hydra-shocks in my daily carry with it. I only give it the three stars because while my glock had no problems with it my wife's FMK didn't like it at all. Happy with the quick shipment. This is decent ammo. no ftf,a little dirty though. For the price I would buy it again. Have used Fiocchi for years.....years. it is quality ammo at reasonable prices. A person can't go wrong with it. No issues, clean ammo. Seems like a great deal. So far we ran 200 rounds of this Fiocchi 9mm through our glock 17 and CZ7b without any issues. Shooting as good as our Blazer, PMC and Magtech. Can't see why I would not buy this again if the price is right. Good performance without breaking the bank. Fairly clean, prints good groups. Tried it along side more costly ammo, and I am happy to say Fiocchi held its own. No misfires, FTF or FTE. A good choice for low cost performance. Will buy again. No fails, clean, brass and go bang - what couldn't you love? Every round fired, but this has got to be the dirtiest burning powder I have ran across. After 125 rounds it took me over an hour to clean my AR 15. My wives AR had the same results with this ammo. Great pricing, super customer service and quick shipping, This is the guy to buy from!!! Great Pricing on a great Product and lightning fast shipment as well !!! This is the only place one should buy ammo from, simple as that, price, customer service and shipping all 110% better than anywhere else!! Everything arrive on time in great condition. Best ammo supplier out there!